Apologies for the long break in service but I intend to get back to providing my market analysis, review and zones of interest for the ES with immediate effect. Thank you to a very kind reader who emailed recently and encouraged me to get writing again. A lot has been happening since I last wrote in early December. The most recent events in February have eclipsed what was a parabolic rise in January. Structurally, there have been some key drivers behind these moves. Shorty volatility strategies being the main one and the break down in this along with concerns of wage inflation beginning to show and a pick up in yields are all contributing factors. The era of super low volatility is likely to be over, which is fantastic news for us traders. That doesn't mean we couldn't still make new all time highs, but if that did happen expect more volatile swings than we saw last year. 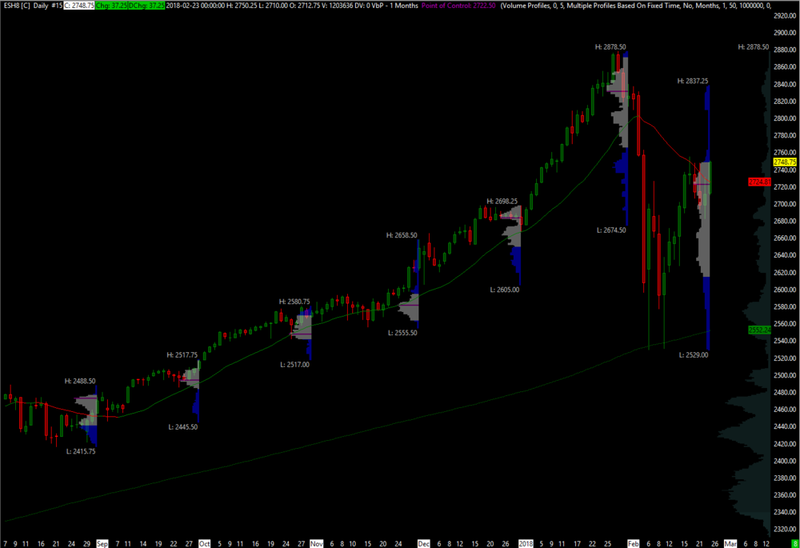 An overview of the daily chart below shows the monthly volume profiles along with a 20 and 200 day moving average. There was close to a 200 point bounce off the 200 day moving average before a re-test and the rally we've seen since. The key levels above Friday's close are the low from Friday Feb 2nd at 2755.25 and the high on Monday Feb 5th at 2763.00. If this rally cannot push through that 2755.25 level and we see sellers defending that breakdown point, then any short term 'weak' longs are likely to bail out and accentuate a liquidation break lower. Continuation higher looks likely from the price action, especially if the Feb 5th high is breached which would be another failure point for shorts and covering needed. Below is the hourly chart with Feb's volume profile. 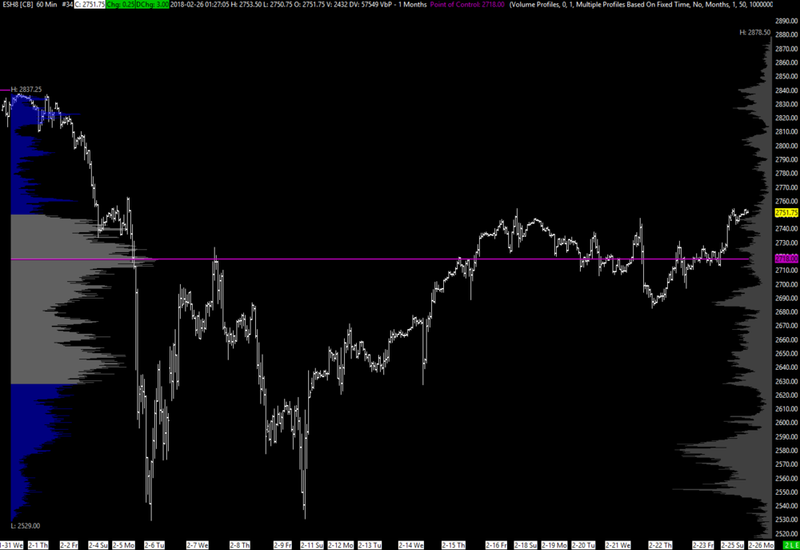 I'd be very cautious shorting this until we see a break down and failed retest of recent highs. I'll update zones this week but in the meantime, initial resistance potential is at 2755.25, then 63.00 and initial support at 2727.75-2729.75 (break out area from Friday). The new FOMC Chairman, Jerome Powell, is speaking on monetary policy at 10am ET tomorrow and Thursday so expect a pick up in volatility again this week.